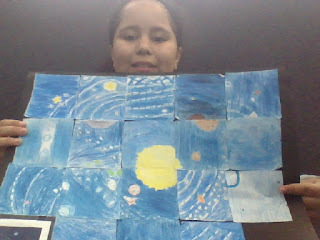 Room 8 made a puzzle of the solar system. It was quite an adventure because we had to copy off a little paper. We had to add detail to our drawing. We had to use our imagination. What I loved well doing this art was drawing up my piece of the solar system. My challenge for this piece of art was drawing my picture.